Indicate the name of the class and section. Once your payment is received, you will be sent an invoice via email confirming your registration. Please contact us at least 48 hours before the start of class if you have not received confirmation. 2 Download the registration form below. The form contains important Vaccination, Training Agreement and Liability Release information. Please complete and sign it. This form is required to be in our hands by the start of the first class (you can scan and email, send via snail mail, fax, or bring completed to the first class) as well as proof of up to date vaccinations from your vet (a hard copy of letter or detailed receipt that we may keep on file). MINIMUM age to attend class is 8 weeks old. 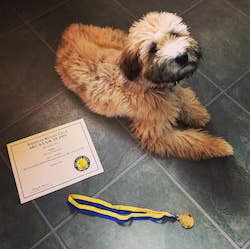 Small breed adult dogs may be accepted into the Puppy Course pending trainer approval though only pups under 1 year of age will be eligible for the S.T.A.R. Puppy Evaluation. All dogs attending class must be friendly toward and comfortable being around humans and other dogs. If your dog is overly timid/nervous, please contact us to discuss if private training might be a better starting place. Start date of a course may be delayed up to a few weeks depending on attendance. You will be notified via email if a start date will be postponed. A spot in class will be saved for you only after you have completed payment. If you prefer to pay by check please contact us before mailing out to us so that we know to expect it and hold a spot for you. A spot in not guaranteed until you receive confirmation from us that one is available. You may also pay via PayPal online at a link we will provide. Please note that you will incur an additional $6 fee to pay via PayPal. Space will not be saved until payment is received. There will be a $25 service charge for any returned checks. Payment is non-refundable though if possible we will accommodate a switch to another class (additional fees may apply). Anyone living with your dog is encouraged to participate in class, though space is limited so please specify attendees on Registration Form. Children under 18 years of age MUST be supervised by an adult and well behaved in consideration of the other students (human and dog). Any student of any age (human and dog) may be asked to leave at any time should they cause disruptions that prevent the class from training in a productive and positive atmosphere (this includes consistent late arrivals to class). We will discuss how to keep our more spirited doggie students calm during class at our first meeting. For Weather-related postponements, you will be notified via email the day of if a class is postponed. If in doubt, please call before coming to confirm that class will be held. Classes are held in our location at 211 Main Street (Route 28) in North Reading.